Nature Pavilion offers a Huge Selection of Science Kits, Experiment Sets and Science Accessories. 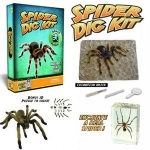 Whether looking for a Science Fair project or something fun to do at home, we have a kit for you! Kits include exploration and experiments in: Archaeology, Astronomy, Biology, Chemistry, Earth and Environmental Science, Physics, Robotics, Solar Energy and Much More. We have Kits for Girls as well!